Here are all the benefits of being a Gourmet! Save on shipping costs - Shipping discounts! Product offerings - offers on products that interest you! In the pantry you can buy the products you liked or of which you wanted to be kept up to date. You will be able to recall the placed orders and reorder products. GOURMETS are pampered by us! - Purchase as a registered customer and you will receive a 5% discount on all products. - Buy € 199.00 of products and do not think about the cost of transport, we will think about it... IT'S FREE! - Take advantage of offers on products of interest to you. They are always updated with new initiatives. - Stay informed on fresh seasonal products and their availability (freshly produced oil, new wine, etc. ...). - Have you tried to buy a not available product , do not worry, you will be notified as soon as it becomes available.  - If you register in the mailing list of Il Cipresso will receive all the news and will be updated on products that interest you and the producers ...................... do not worry, we do not send many emails and however you can unsubscribe at any time!